Valentine’s Day is upon us and so are last-minute orders of roses, trips to Godiva and wrangling reservations at a romantic restaurant. I won’t lie – I like all that stuff, but Valentine’s Day doesn’t have to be about all the traditional things. I enjoy a thoughtful Valentine’s Day gift, or, even better, an enjoyable, laid-back experience. And as much as I love getting all decked out, a chill date means a casual Valentine’s Day outfit that I can relax and have fun in, like this outfit from Tobi. 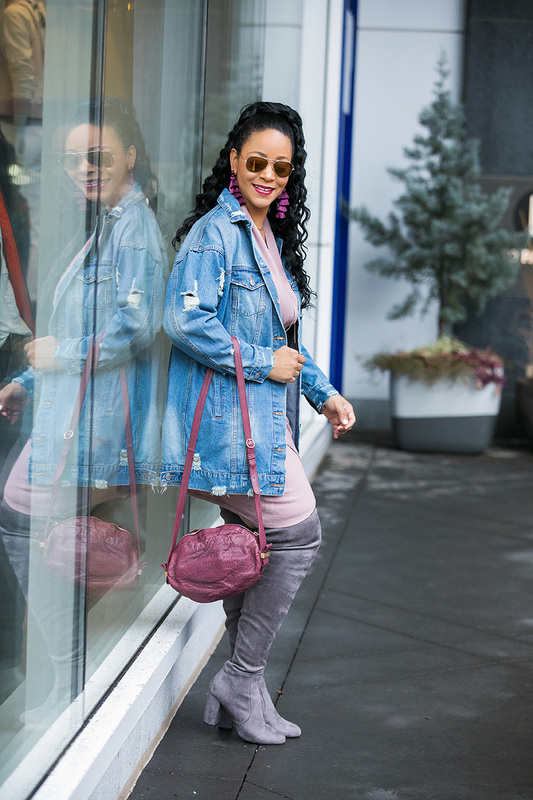 This wrap sweater dress comes in mauve, wine and black, and is comfortable yet glam enough to wear for a date night – or Valentine’s Day date. The dress is has an open front that you can adjust per your personal style. I rocked it with a layered gold necklace to grace my neckline. If you prefer to show more décolleté (and why not, it’s the holiday of love, after all! ), a silicone bra underneath is the best option. To keep my look more on the casual side (in line with a casual Valentine’s Day date), I paired it with an extra-long, distressed denim jacket. It’s a fun alternative to the standard, and it feels like you’re wearing your man’s coat. So sweet! 1. Go to an improv or comedy show – and if you’re feeling adventurous, sit in the front row! How do you plan to spend your Valentine’s Day (or galentine’s day)? Disclosure: This post was sponsored by Tobi. The opinions expressed are my own.